With the continued increase in popularity of motion capture, more and more photographic lighting companies are expanding their lines and offering continuous lighting products. Profoto is one of a handful of respected lighting manufacturers known for their flash units to not only offer a line of tungsten continuous lights, but also HMI lights as well. Continuous lighting tools are not new for Profoto, as they marketed both a HMI and a tungsten unit, several years ago: But the new products, the ProDaylight 800 Air and the ProTungsten Air, are not a simple retooling, but represent a major rethinking and development. For the photographer who is shooting both stills and motion, particularly in a studio location or on a set, these lights expand the possibilities of modifying continuous light with the broad range of Profoto light shapers that they have been using with flash; both units are compatible with Profoto’s zoom reflector system, which gives one the ability customize the light shaping effect. Additionally, Profoto has introduced a few new tools that shape light in a manner that many experienced cinematographers are familiar with. For anyone familiar with the D1 Air monolights, both the ProDaylight and the ProTungsten will feel like old friends. With the exception of the glass domes and a protective cover that uses the very elegant Profoto collar lock system to secure it to the base unit, the shape, feel and control layout of both the ProDaylight (above) and the ProTungsten is similar to the D1s. Both units are fitted with a cooling system which is extremely effective. 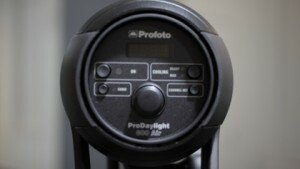 I was surprised at how relatively quickly the ProDaylight 800 Air was ready to be packed up after two hours of continuous use. The Air Remote allows you to turn the units on and off as well as control the dimming function — the ProDaylight can be dimmed by 50% and the ProTungsten can be dialed down to 10 % (keep in mind if you dim the lamps, you will see a change in color temperature.) In fact, the Air system gives photographers the ability to not only control both flash and continuous lighting with the remote, but to control them via the optional Studio software. The lights and all of the accessories are beautifully executed. They feel substantial and the fit and finish are superb. At this point, I want to turn my attention to the ProDaylight. I first have to mention the ProDaylight‘s ballast (above right): I looked at it and thought to myself this thing must weigh about 25 or30 pounds. Was I in for a surprise! It is more in the range of 15 pounds and could easily be picked up with one hand even though it has a double handle. In addition to the smartly executed integrated handles, the ballast is cooled, not by a fan but by heat sinks. This contributes to the unobtrusive operation that is critical when recording sound with motion work. Now if you want to talk about the quality of light, you really have to consider the light in conjunction with the light shaper system. The quality of light is superb. The ProDaylight is at home in a 300 cm Giant Reflector, the Magnum Reflector, the Softlight Reflector with grid, the soon to be released 7 foot “slim-profile” octobox, or a traditional rectangular softbox. The variety of effects one can achieve by using the ProDaylight in different modifiers and in conjunction with placement is mindboggling. In my opinion, this is the real strength of the Profoto continuous lighting system, and one of the advantages that these and other tungsten and HMIs offer over current LED products. The two images below show just how different the results can be using the ProDaylight with different modifiers and working distances. The image above is a still grab from video taken with, the ProDaylight placed in the gridded Softlight Reflector. The image below is a still grab from video taken on the same set (same white background) with the ProDaylight and a Magnum Reflector. When working with HMI’S and other HIDs you should always caution your models not to look directly at the light. In addition to the existing photographic tool, Profoto is introducing a new range of softboxes designated “HR” which can be used with either continuous light or flash. They have also added three different sizes of lanterns to the product mix. For the more traditional movie lighting approach, Profoto has introduced the Cine Reflector, a “PAR” can reflector that can be “zoomed” in the same manner as some of Profoto’s other reflectors, and one to control the light spread without the use of lenses. There is a Lens kit and a Scrim kit available which offer additional and more traditional control. 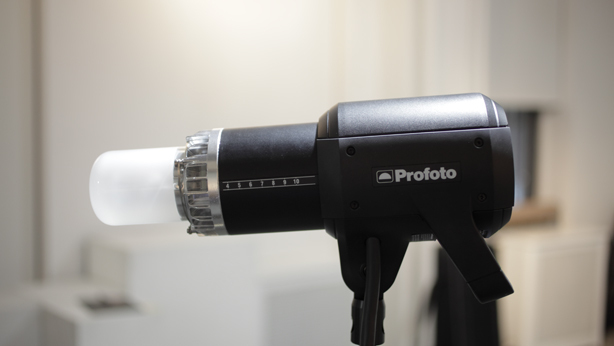 According to Jae Hong Park, the Swedish-based Product Manager for Profoto, more lighting products are under development. Hopefully this means we will see a 200 and 400 watt HMI unit soon. 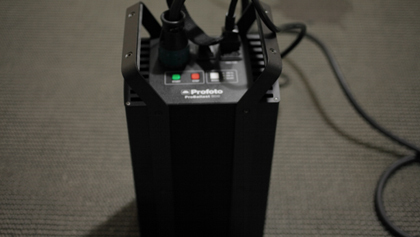 The MSRP of the ProDaylight 800 Air is around $6400; the MSRP of the ProTungsten Air (which can accommodate either a 1000 watt or a 500 watt lamp) is $999. Part 2: Beauty and the ProDaylight Air, an article (with video) on the ProDaylight 800 Air in use shooting stills and motion, will be published here on June 8. Thanks to Cliff Hausner, Dan Cuny, Profoto USA, and Calumet Photographic NYC. Wow! What camera and ISO did you use for the model shots? The HMI looks cool, but are these lights really feasible for most photographers? The grabs are from video footage taken with the Panasonic GH2. I don’t recall the ISO setting on the first image, but the blond model was shot with the ISO set to 320. As for your question about “feasibility,” The answer is a resounding yes, they are viable options for image makers who have the business which demands high output continuous lighting. While I acknowledge HMI lighting is expensive, in many markets there is the option to rent equipment like this on an as need basis which eliminates the cost of purchse from the equation. I noticed that you have also shot with the K5600 Joker HMI: Which is better the Profoto or the Joker?